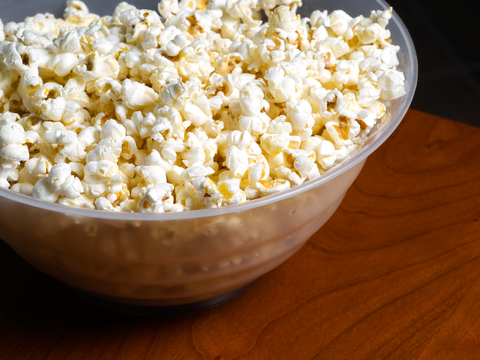 Share the post "Spicy, Savory, or Sweet: Makeover Your Popcorn"
Popcorn is a simple and delicious snack to keep around. But don’t bother with those pre-made microwave popcorn packages. They are loaded with nasty chemicals and artificial ingredients (delete them off of your grocery list app NOW). You can easily make plain popcorn at home and then dress it up any way you like. Start with a big pack of unpopped popcorn kernels. A friend recently told me there were about 8-10 different varieties of popping corn when she went to a local farm store. Oh the possibilities! Maybe you can buy a few kinds and have fun deciding which you like best. There are a few different ways you can make popcorn. If you own an air popper it is easy to make as much popcorn as you want without much hands-on time from you. The traditional way (or old-fashioned as people often like to think of it) is in a big pot on the stove. This involves you paying careful attention to the popcorn and shaking the pot around to keep it from burning. One way that is becoming increasingly popular is to make it in the microwave. Simply put 1/3 of a cup of unpopped kernels in a brown paper lunch sack, fold the top down a couple of times (you can tape it if you would like) and then lay the bag down in the microwave. Then pop as you would any microwave popcorn. Now that you have your plain popcorn you can add melted butter and salt and sit down with a movie. But wait…if you have plain popcorn why not have fun with the flavor? You can make something to please every taste. It’s best to add butter or some sort of oil to help your seasonings stick. With all of this delicious inspiration, have fun trying a variety of popcorn flavors. You could even have a popcorn tasting party with friends and family. With so many possibilities make sure to keep your popcorn party list organized with your grocery shopping app. Do you have a favorite popcorn flavor that we missed? Have you come up with an interesting combination? Share it with us!